Clover's Tryder G7 jumbo was a landmark purchase for me for a variety of reasons. It was the first Japanese jumbo that I'd ever actually purchased from Japan, via renowned toy dealer Masato Shono (our first of many transactions). It was also the first time I'd actually spent $1000 on a toy. This is memorable because it's a surefire sign that you're in deep and there's no turning back. I'll also always remember it since it arrived at my house on the morning of 9/11/01, at almost the exact moment the planes hit. 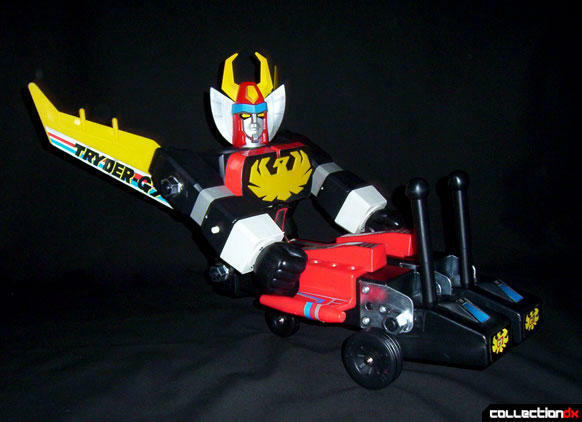 Though the toy is most often grouped with the Jumbo Machinder line of toys, it is technically called the "Tryder G7 Ride-On Combination Set", because it is designed to transform into 3 of the 7 combinations that the robot can form in the animated series. It was also intended to be able to be ridden by a small child. I'll try to touch on all three forms of the toy in this review. Assembly of the robot is pretty simple. It's basically held together by 3 plastic rods with a bolt on either side. You put the feet at the bottom of the legs and slide them onto either side of the little rod with the raised part in the middle. (This doesn't allow the feet to be pushed together.) Then tighten with the bolts on the outside. Then connect the legs to the pelvis and and slide the next rod all the way through and add the bolts to either side here. The pelvis is a thin piece that runs up the middle of the torso to the stump of the head. You need to place both parts of the torso against this and slide the long rod through all three parts to hold them in place. There will be extra length on either side and you slide the arms on here, finally tightening the whole thing with two more bolts. Then slide the vinyl head over the stump on the top and place the chest emblem into the holes. Lastly, you'll need to attach the wings. 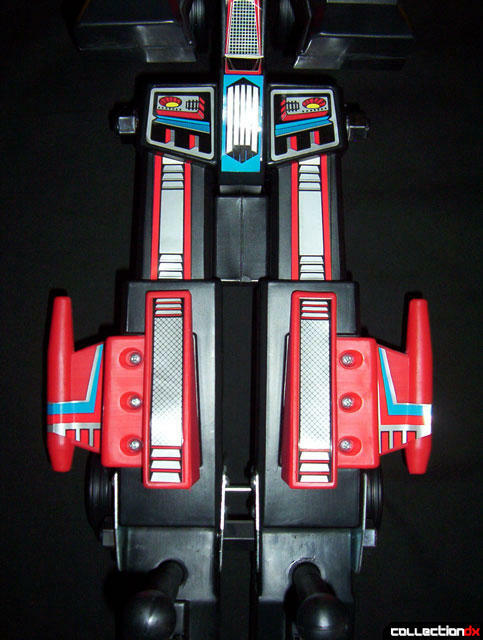 There are two vertical columns on the back of the robot, each with a hole on the top and bottom. To get the wings on there, you simply line up the bottom tab on the wing with the bottom hole, insert and then line up the top part to allow it to rest in place. When completed the robot stands approximately 25.5" tall and 12" wide. It is 22.5" from wingtip to wingtip. Though Tryder's size is impressive, it can be very difficult to display him with more traditional sized jumbos. It does have shooting fists like most jumbos, but it is also one of the few to actually have metal in it. The connecting pieces at the ankles are metal. In robot form, the jumbo has very clunky proportions. Everything is a little too squared off for my tastes. 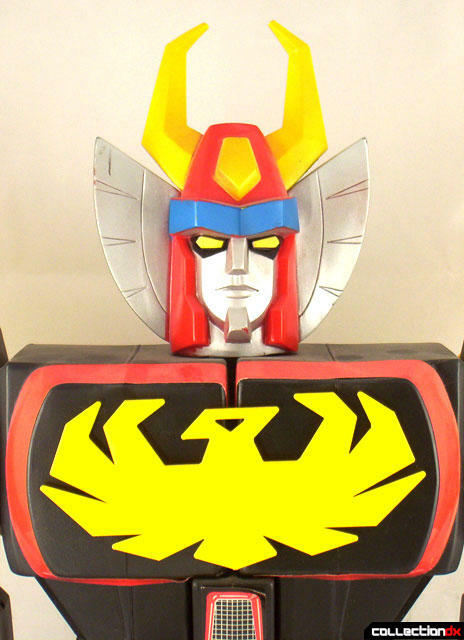 However, I think that the impressive wingspan and excellent design of the head and chest piece make up for that. 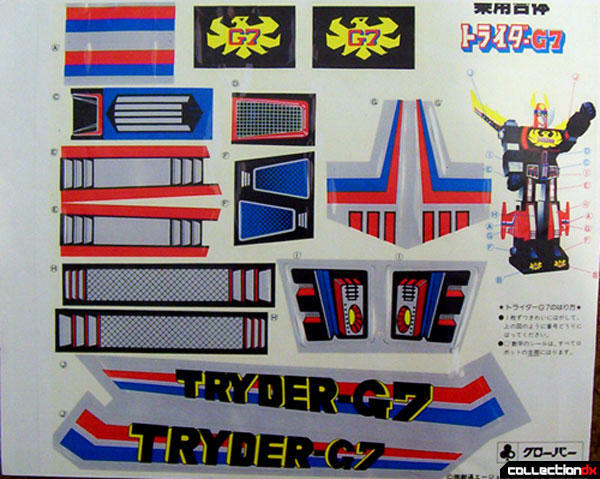 Tryder Beagle is basically Tryder G7 sitting down and as such is very easy to transform into. Simply remove the legs from the pelvis, reposition them 90 degrees and reattach. You must also place a set of wheels in between the legs before tightening. This wheel goes in the same place in both Tryder Beagle mode and Tryder Cosmic mode. Another set of wheels on a metal bar is placed into slots on the bottom of the feet, which need to be turned down. This will also allow you to place the included "handle bars" into a hole on the top of each foot. (This hole is hidden in robot mode.) Finally, slide the third set of wheels onto the ridge on the back and tighten using the small rod and bolt. 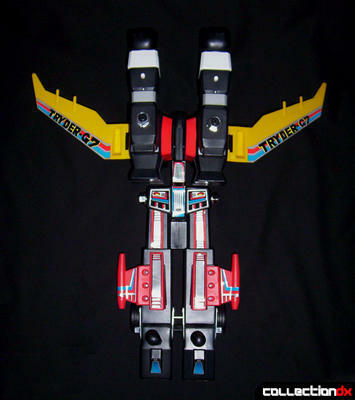 Tryder Cosmic is easily the better of the two ship modes that this toy can form. Naturally, it's also the more difficult of the two. First, remove the head, chest piece and wings. Then take the entire torso apart as well. You will need to place the front and middle wheels exactly the same as in the Tryder Beagle mode, but the third set is different this time. Slide the two sides of the wheel piece around the thin part of the pelvis (the part that normally runs through the two torso pieces) and tighten as before. Then there are two more plastic rods that need to be pushed UP through two more holes in the side of the wheel piece allowing for the attachment of the two torso pieces on top. The torso pieces need to be turned so that the arms can go on top of them (on the same rods), as opposed to on the side. Place the arms on top pointing backwards and tighten with the bolts. Add the wings on the side and the handle bars in front and you're all done and ready for a ride. Personally, I'm no fan of either of these modes. Though I had a wee bit of fun assembling them for this review (the first time I'd actually done it since purchasing this), I can't see myself ever doing it again. I bought this for the robot, nothing else. The box for this toy is 15" tall, 11" wide and 9" deep. 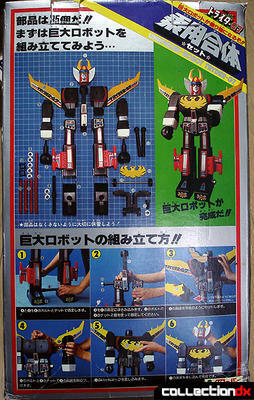 All the instructions for the toy are shown on the side and back of the box. Surprisingly, in doing research for this review, I discovered that there are at least two different box variations out there. The difference lies in the back side of the box. Having just discovered this variation, I'm unsure which is the more common of the two. 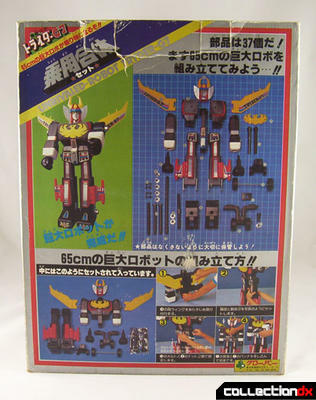 With the exception of the chest piece, all the detailing on the toy are from the enclosed sticker sheet, a copy of which is shown below. 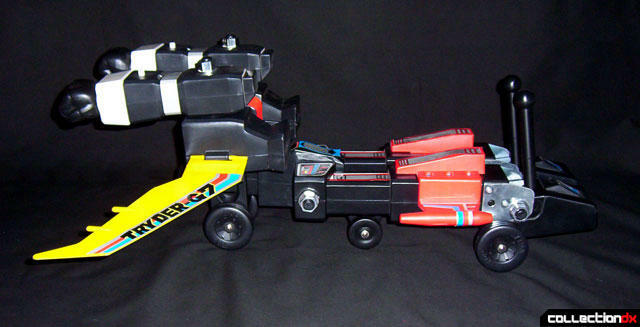 The Tryder G7 Ride-On Combination Set is one of only three jumbos to have been produced by Clover, along with Daiojya and Aura Battler Dunbine. It is not as common as Dunbine, but far easier to get than Daiojya, which almost never shows up. sweet review Dave. Funny, for some reason I've never really known about the different modes for this guy. Still great review, thanks for posting and keep up the good work. I never knew this toy ever existed! So Japanese kids had another option besides POPY's Jumbo Machinder Spazer! Nice review, Dave. Thanks for sharing.